Kosuke was born in Shiroshi City in quake-stricken Miyagi Prefecture. Kosuke works for a venture firm famous for community development in Shimane Prefecture in western Japan. 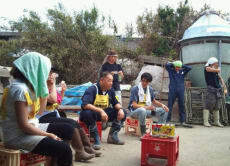 After returning to his hometown after the disaster, Kosuke started this volunteer project to assist with the continuing relief efforts and to provide those eager to help with the means to create tangible results. Kosuke hopes his experience in Shimane can contribute to Tohoku's recovery and promote others to volunteer in Tohoku and gain a sense of its current reality.